I was asked to make a cake for a man who does property’s up. I was asked to do a man and decorate the cake with tools. I made the man’s body in blue to resemble overalls and made a t shirt in white. I then made the cross over straps in blue and then made the head and arms. I made the black shoes and attached them beneath the overalls. 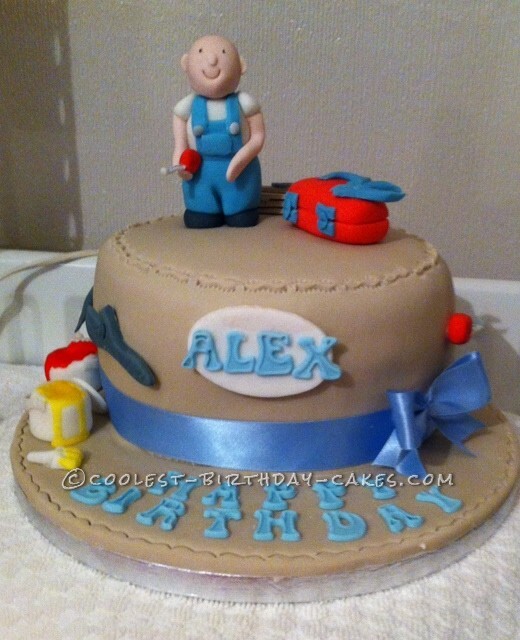 I then made a red tool box and then made a large tape measure for the side of the cake and a small tape measure to attach in the man’s hand. I made a claw hammer, an adjustable spanner and a screwdriver and then a saw. I also made two paint pots and two lids and two paint brushes. I cut out the wording in blue. I made some small pieces of wood for the top of the cake. I started by baking a chocolate sponge and filled with chocolate butter cream and jam. I then covered the whole cake in chocolate butter cream and chilled. Then I colored some icing in light brown and covered the cake and board. I set aside to harden slightly. 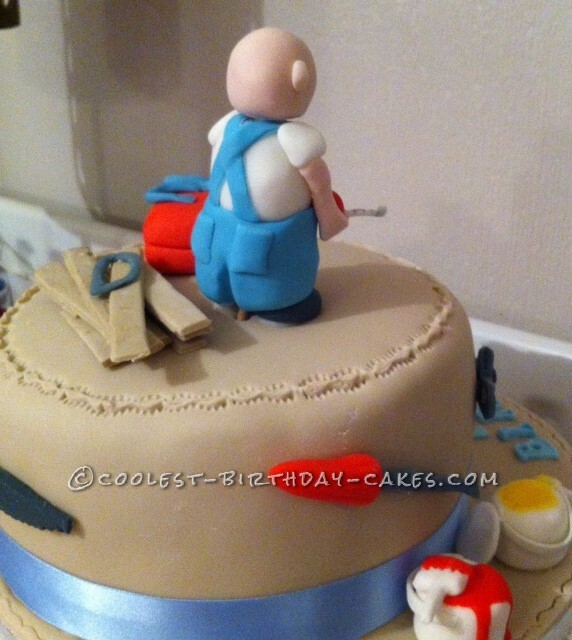 Now I attached the man, toolbox and wood to the top of the cake. I then attached some blue ribbon to the base of the cake. Finally I attached the tools around the cake and the wording to the cake board and then I colored some royal icing in yellow and red and filled the paint pots dribbling down the side of the paint tin. I then attached the oval plaque to the cake. The cake was now finished.